If you are choosing between the different options for timber external cladding, you may have heard Thermowood Cladding mentioned and wondered what it is. How do you know if it is a better choice for you than other building materials? 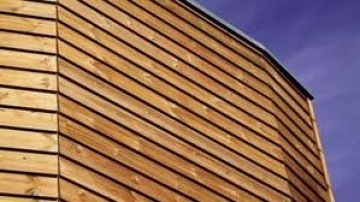 Thermowood cladding comes from Scandinavian softwood timber that has been heat treated. When Thermowood is manufactured, it is subjected to pressure and heat, as well as nitrogen and water vapour to control the drying process. This treatment is carefully observed and can take anywhere from 24 to 96 hours. The timber is subjected to temperatures ranging from 180 up to 230 degrees Celsius, depending on the species. When the wood is subjected to intensive heat, it dries out deep into the core and any moisture and resin is removed from the timber. With lower moisture comes higher weather resistance, meaning that thermally treated wood can be used for outdoor purposes such as facades and exterior cladding. Also, when wood is heated to a certain temperature it becomes much less appealing to insects, which also enhances its longevity. Thermowood should last several years and does not need surface treatments applied to it. Some people choose to finish their Thermowood cladding with a stain, but if left to weather naturally the wood changes to a silvery grey colour similar to cedar or larch. Because Thermowood is processed using heat and water vapour, rather than chemicals, it is much better on the environment than other chemically treated wood. Most people choose Thermowood for this reason coupled with its' durability and good looks. The pine from Finland that is commonly used to make Thermowood is always sourced from sustainable forests. To make sure that you are choosing an environmentally sourced Thermowood, make sure that it is certified under the Programme for the Endorsement of Forest Certification (PEFC) or Forestry Stewardship Council (FSC) Schemes. These international non-profit organisations regulate sustainable forest management. Thermowood is actually cheaper than most hardwoods, making it a very affordable choice for most homeowners and developers. As the treatment process does not involve any chemicals, it is less expensive to produce. Manufactured using the power of heat rather than harsh chemicals, Thermowood is an inexpensive, environmentally friendly, and resistant building material which is proving to be very popular, especially for external cladding. Contact Bennetts Timber for more information on 01472 350151.